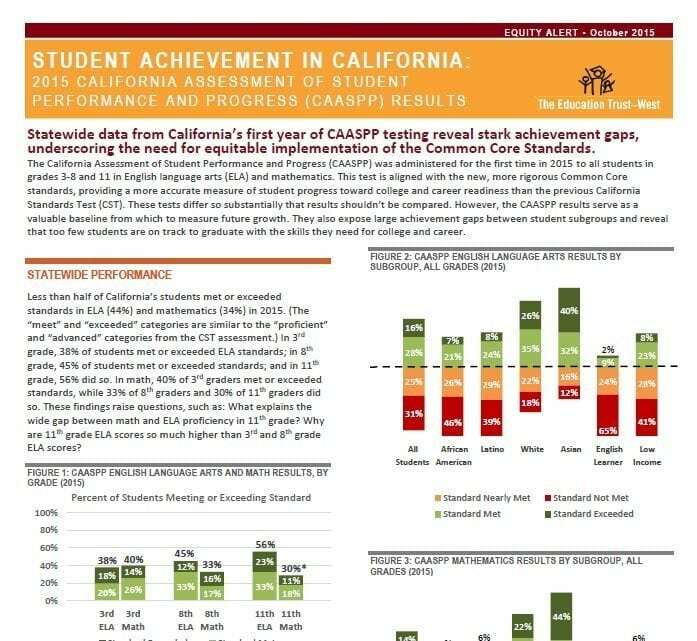 As California implements our new state standards for education, assessment results tell us how students are doing on the college and career ready standards and provide helpful insights for educators. The Education Trust-West has conducted a preliminary analysis of the baseline 2014-15 assessment results to give education advocates, parents and other stakeholders a better understanding of what these results mean. Below are a series of resources to help make sense of these results. Download the presentation below for a comprehensive overview of the results. You can also download a comprehensive pdf of district CAASPP results. This file lists the percentage of students meeting or exceeding standards, by subgroup, for each school district. For a deeper dive analysis into the results and to learn about high-performing schools where low-income students are meeting and exceeding standards at high levels, download our Equity Alert.